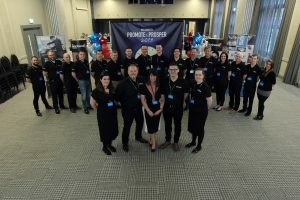 We had an excellent response to this year’s Promote and Prosper event and received huge support from within the industry’s top promotional product and branded clothing suppliers, who displayed examples of the latest promotional items available on the market. Sessions throughout the afternoon included; Question Time, hosted by Blair Jacobs, joined by a panel of experienced and well respected business people from Hull including; Martin Lauer from The One Point, Christina Colmer-McHugh from Moodbeam, David Kitney from Emmerson Kitney and Paula Litten from Pro-Fusion Partnerships. Together they discussed the question: is it business or personal and how do we engage emotionally with our employees, clients and suppliers? Mike Rice shared the success story of Hugh Rice Jewellers. He gained vast knowledge and experience since joining his brother in the watch and jewellery trade in 1976 and, has helped the company to become a nationally recognised and award winning jewellers.